Some wreckage sites have a surprisingly significant value. Centuries have not washed away the beauty and importance of these historic monuments. Most of them are also founded in the staggering surroundings, thus providing an amazing experience all around! The iconic Greek beach on the north-west shore of the island is incredibly beautiful. The white sandy beach and clear blue water are accompanied by the steep limestone cliffs, that isolate the beach and make it an intimate retreat. The wreck of a ship Panagiotis is found on the beach and ads up an extra thrill to this idyllic place. The ship was transporting contraband cigarettes and wine, when it was chased by the authorities and caught by the storm. It hit the shore and was abandoned. This is the most famous European beach. It features in the main travel magazines and definitely is worth visiting! A small uninhabited island in the Mediterranean Sea provides a range of versatile outdoor activities. Once claimed by Italy, Kekova ultimately was assigned it to Turkey. An ancient city was established here before Christian era, however it had been destroyed by an earthquake in the 2nd century. Crystal clear turquoise water and ancient ruins, that are sunken under the sea or scattered around the island, as well as swimming are popular attractions. To explore pristine nature and historic ruins. In the 90’s swimming was prohibited so that to preserve the heritage. However, the prohibition was lifted later and now it is accessible for all sorts of touristic purposes. Fanad juts out into the Atlantic Ocean and offers some amazing landscapes. It also has Blue Flag beach in Ballymastocker Bay, that is often listed as one of the most beautiful beaches in the world by the magazines. Even the well preserved ruins of The Great Roman Wall stretch in Fanad. Sandy beaches attract swimmers, as well as surfers. And even more for the action loving travelers: golfers love Portsalon Golf Club, which is situated in the picturesque fields. The very well preserved Pre-Columbian Maya walled city is a top attraction in the country. It used to serve as a Caribbean Sea port and protected against the invaders in 13th-15th centuries. Today the ancient port is the third most visited site in Mexico after Teotihuacan and Chichen Itza. It is found near Cancún – another favorite destination for the vacationers. The tourists can visit the ruins on their own or have an organized one day tour. Besides seeing the best preserved coastal Maya site, which is surrounded by beautiful nature, also visit some of the many cenotes found in Tulum. Photo by Enrique Reyna H.
An Ancient Maya archaeological site preserves an impressive abundance of historic heritage. It used to serve as a ceremonial center and it is even said that there is a ghost: a woman in white, with glowing red eyes ascends the flight of stairs of “El Castillo” occasionally. “El Castillo” is a monumental structure – the ancient temple is the most important and impressive on the site. Belize, with its sandy beaches and crystal clear water, is a popular holiday destination. Meanwhile Xunantunich is a wonderful historic site, which introduces to the Mayan culture. Very well preserved buildings allow to admire the ancient glory. The magnificent spot was built by ancient Greeks in 399 BC and became the capital of the Kingdom of Pergamon in 281–133 BC. Pergamon gives a glimpse of the greatness of it: the rich city used to impress with architectural monuments. Today the ruins of the historical city are widely visited by tourists. Explore the well preserved ruins, that take back centuries ago! The ruins of the ancient city Decapolis are the best preserved Roman ruins in the region, which was inhabited in the Bronze Age already. The hippodrome, temples, arches, theaters and other architectural will take you back in time. It is the second most popular site after the desert jewel – Petra. The tours are supplemented with the performances of the Roman Army and Chariot Experience, that take place at the hippodrome twice daily. Three week summer festival includes theater, dance and music performances. Jerash Festival is even visited by the royal family of Jordan. 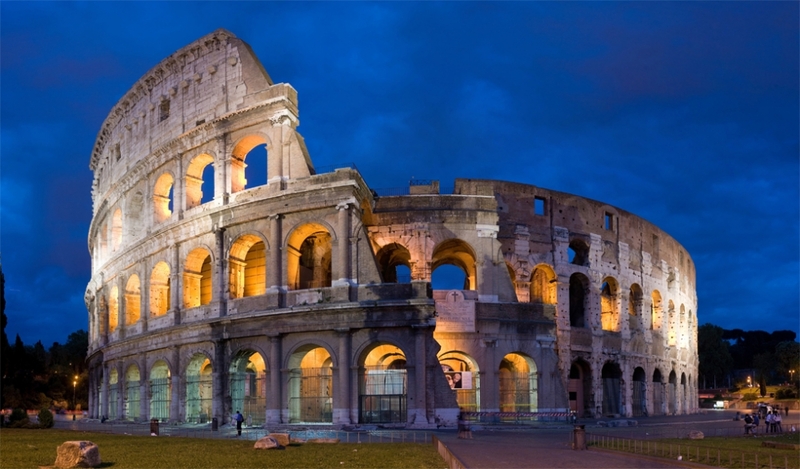 Discover the enormous Ancient Rome arena, where gladiators’ fights were held. The building had 50 000 seats, that could fill up in just 10 minutes. The historic monument stands at the heart of modern Rome and attracts thousands of tourists every year. Discover the colossal spirit of Ancient Rome. One of the most famous and well preserved monuments of the Romans. Only one hour drive from Banbgkok, the old capital of Ayutthaya was once a thriving and prosperous city where the majority of the country’s trading took place. Ayutthaya attracted traders and emissaries from all over the world and maintained close diplomatic ties with countries such as Portugal, China, Japan and France. Art and culture flourished in Ayutthaya, evident today from the many beautifully designed buildings that make it a popular tourist attraction. In the heart of the Eternal City of Rome one can find the ruins of once the most important and glorious state – the Roman Empire. The wreckage site used to serve as the government buildings. Here citizens gathered to celebrate victories, for elections, trials, commercial affairs and even gladiator matches. Today an impressive number of visitors of around 4,5 millions explore the Forum every year. One of those unforgettable places to see at least once in a lifetime.